We made our orchestral score, as well as the particelle, based on a reproduction of the manuscript score but also on recordings and the piano-vocal score, when the manuscript score was not perfectly clear. It was quite a task because of the different writing conventions of Donizetti's time. Because of the size of our theatre, the opera was scored for a reduced orchestra: two french horns rather than four, one instead of three trombones and one each of oboe and bassoon instead of two. Thus, we ended up scoring for 2 flutes + piccolo -1-2-1/ 2-2-1/ strings, timpani and percussion, numbering 37 in all. The resulting performance received considerable praise from both the audience and critics. 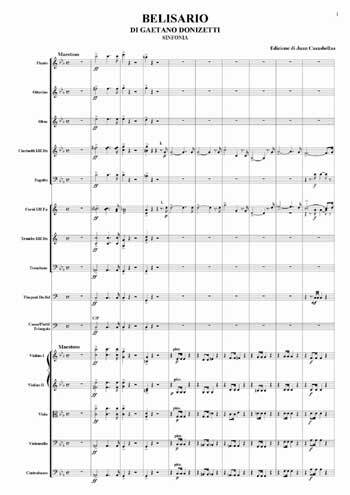 The first four pages from the score can be downloaded from here. If you are interested in more details about the score or hiring it, then please contact Mr. Frank Marmorek, president of Buenos Aires Lirica (frank@balirica.org.ar) or the creator of this new edition, Juan Casasbellas ( j.casabellas@freesurf.fr). A report and photographs of the production together with two short excerpts from the overture can be found here.